Our Products >> COLLECTIBLE AMMO, Current & Obsolete, All Countries. >> SINGLE Collectible Cartridges, Currect & Obsolete, All Countries >> PISTOL Calibers, Single Cartridges, All Countries. >> "INCH" Caliber Pistol Single Cartridges >> .45 Super, Single Cartridges >> .45 Super by Buffalo Bore, JHP, One Cartridge not a Box! 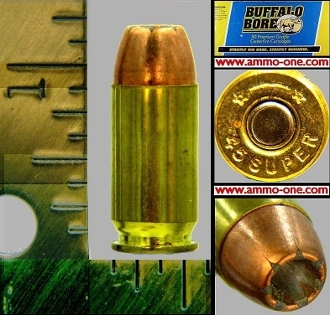 One Cartridge: 45 SUPER, new production by "Buffalo Bore Company", Idaho produced using new Starline brass cases with “*Ω* 45 SUPER ” Head-Stamp and 185 grain extreme JHP (Jacketed Hollow Point) projectile. NOT a .45 Automatic. Please note: This item is in single pistol and rifle and military pistol and rifle single cartridge sections, as this is a pistol and rifle cartridge and used in the military. History of the 45 Automatic Cartridge: Many shooters and collectors think of this cartridge as a 45 Auto +P, extra pressure, or extra power load. However it is more thenjust that. The .45 SUPER is a different case then the .45 Automatic , the outside dimension are the same as a .45 Automatic, but like the 5.6 NATO vs. the .223 Remington, the case is thicker, to handle higher pressure loads, making this a different caliber. Do not shoot the .45 super in a .45 Auto firearm. The .45 SUPER may have double the energy of a .45 Auto! Below from the ammoguide.com web-site; Dean Grennell, Tom Fergerson, and Ace Hindman designed the .45 Super® in the 1980's to provide significantly increased power over the historic .45 ACP. Ultimately, the cartridge was refined by Hindman at Ace Custom .45's in Kerrville, Texas. Ace now chamber the .45 Super® in S&W .4506 and Glock handguns as well as 1911's. The exterior dimensions of the .45 Super® case are identical to the .45 ACP, but differ internally to permit the Super increased pressure-handling capacity. .45 Super® cases are available from Starline. Because the .45 Super® and .45 ACP share the same external dimensions, .45 Super®-modified handguns are extremely versatile, requiring no additional parts to be changed to switch between cartridges. Due to the identical external dimensions and the higher pressure with the .45 Super®, care must be taken to insure that .45 Super® ammunition is not fired in unconverted .45 ACP handguns. 45 Super® is the trademark of Ace Custom .45's, Inc.
.45 Super by Buffalo Bore, JHP, One Cartridge not a Box!